While what exactly goes on within the event horizon of a black hole is still well within the realm of theoretical physics (and it’s said that at the very heart of a black hole physics as we know it gets a serious kick in the pants) researchers are learning more and more about what happens in the immediate vicinity around a black hole, within the flattened disk of superheated material falling inexorably in toward the center. Using supercomputers, scientists can model the behavior of black holes’ accretion disks and see how gas behaves as it gets accelerated and drawn inward, heated to millions and even billions of degrees. “Our work traces the complex motions, particle interactions and turbulent magnetic fields in billion-degree gas on the threshold of a black hole, one of the most extreme physical environments in the universe,” said lead researcher Jeremy Schnittman, an astrophysicist at NASA’s Goddard Space Flight Center. 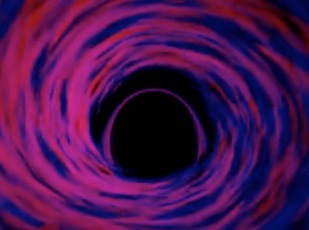 Gas falling toward a black hole initially orbits around it and then accumulates into a flattened disk. The gas stored in this disk gradually spirals inward and becomes greatly compressed and heated as it nears the center. Ultimately reaching temperatures up to 20 million degrees Fahrenheit (12 million C) — some 2,000 times hotter than the sun’s surface — the gas shines brightly in low-energy, or soft, X-rays. For more than 40 years, however, observations have shown that black holes also produce considerable amounts of “hard” X-rays, light with energy tens to hundreds of times greater than soft X-rays. This higher-energy light implies the presence of correspondingly hotter gas, with temperatures reaching billions of degrees. Working with Julian Krolik, a professor at Johns Hopkins University in Baltimore, and Scott Noble, a research scientist at the Rochester Institute of Technology in Rochester, N.Y., Schnittman developed a process for modeling the inner region of a black hole’s accretion disk, tracking the emission and movement of X-rays, and comparing the results to observations of real black holes. Using the data generated by Noble’s simulation, Schnittman and Krolik developed tools to track how X-rays were emitted, absorbed, and scattered throughout both the accretion disk and the corona region. Combined, they demonstrate for the first time a direct connection between magnetic turbulence in the disk, the formation of a billion-degree corona, and the production of hard X-rays around an actively “feeding” black hole. Previous Post A Solution to a Slippery Slope: CO2 Sleds on Mars? Next Post Want to see a BILLION-pixel view of Mars from Curiosity?